Smartphone users, specifically T-Mobile users looking forward to pre-order the HTC G2 won’t have to wait anymore. T-mobile today officially updated its page to start taking pre-orders for the T-Mobile G2 smartphone. According to the carrier, the HTC G2 would be made available for delivery from October 6th but only for those who book the order by October 4. T-Mobile will roll out the device for $249.99 before a $50.00 rebate, on contract and $499.99 outright. T-Mobile has also kept a condition, for pre-ordering you need to pin in your T-Mobile number and the password in order to book the G2. T-Mobile G2 is all about speed over the fastest network available. The mobile is powered with the blazing-fast 4G speeds over the carrier’s network. Faster web browsing and search compared to the T-Mobile G1. Experience fast download on almost everything as well as from the latest Android Marketplace. Experience online videos with uninterrupted YouTube viewing. 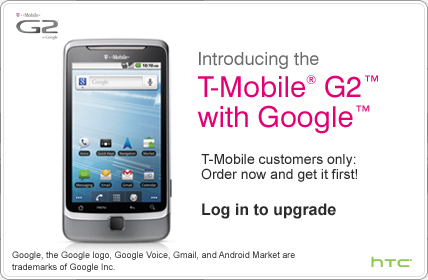 The T-Mobile G2 is now powered with Google’s Voice Control. Commands spoken by you and delivered by G2. With this feature Google makes the G2 more faster and easier to call contacts and businesses, sending messages, browsing the web and search specific business by name, listen to music and complete common tasks.